Any disadvantages with a front 100/90 19” tire? Planning on buying the mitas e07. Re: Any disadvantages with a front 100/90 19” tire? I really like how it handles as well! Both high and low speed. Pirelli scorpion trail ll, seem to be wearing well and good in the wet and dry, some people have had problems with them on here but for me they have been great. 110/80 x 19 are radials and 100/90 x 19 are cross ply tyres. Radials are slightly more susceptible to sidewall punctures which is why manufacturers usually spec cross plies for the front of ADV bikes. If you are using the tyres only on the road or in some sort of 90/10 road/dirt type combo the radial 110/80 x 19 will give you better turn in and more stable cornering. The difference is immediately noticeable if you ride bikes with both sorts of tyers one after the other. The actual outer diameter of the tyres is only a fraction of an inch different and even putting them one on top of the other on the ground you would be hard pressed to see it. That's interesting the other reason for going down the Pirelli scorpion trail ll tyres was when I bought the wheels they came complete with discs tyres etc, the rear tyre was as new the front close to being worn out so bought a new front one to match the rear, maybe the next set of tyres I will try the 110/80 if the hight difference is really very minimal. 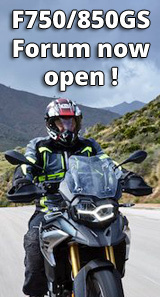 It seems like the Tiger 800 between 2011-2015 has 110/80 as recommendation and later models with 19” has 100/90. Wonder why triumph changed? The rims exactly the same?